Over the weekend I went to the Peter Serkin concert, pianist Peter Serkin with the Buffalo Philharmonic Orchestra, and I saw the Kraemers. They sit behind me. My brother George went with me and he was laughing that it is just like at a Bills game, you get to know the people who sit in the same section. Anyway at halftime, I mean intermission, Mrs. Kraemer asked me, "Who did your teeth?" She was telling me how nice they looked! That was so sweet of her. It made me feel all happy and glowing. I love the way she asked who did them. I like that phrasing. I told her Dr. Kevin Hanley did them. He is my Facebook friend on Kenmore Avenue. "They look beautiful," Mrs. Kraemer said. She said she and her husband know Dr. Hanley. She said her husband is a dentist. Well, I guess he is retired now. But I realize that all this time when I have been saying Mr. Kraemer it is wrong. He is Dr. Kraemer! This is all so ridiculously Buffalo but I am supposed to tell Dr. Hanley that the Kraemers say hello. Which reminds me, I have totally dropped the ball on a lot of things and my appointment with Dr. Kevin was one of them. I was supposed to have gone there two weeks ago, zut alors, alors, alors. At least I have been wearing my retainer at night. I have only missed two nights which is not bad considering. This is a new habit with me, wearing this retainer. And it surprising how easy it is to slip up, to go to bed and fall asleep never thinking of putting the things in. There are really two separate retainers, one for the uppers and one for the lowers. That is a picture of a retainer up above. And here is what they look like on my dresser except for my case is sparkly red. 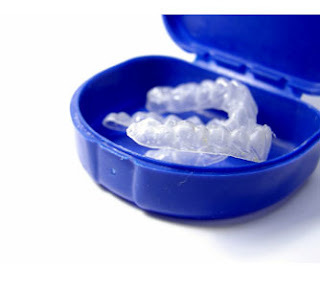 Wow, it is hard to find good pictures of retainers! Most of the pictures are so gross. Anyway, what with my head full of Leonard Pennario it is sometimes hard to remember to put that retainer in, too. But I have been doing all right. Today is the day I make my appointment to go on in. Thank you to the Kraemers for the handy reminder. I hope you called the office today, Mary. We did miss you when you forgot your last appointment! But, it is a good thing you are wearing your retainers. Remember, wear them until you don't want your teeth to be straight anymore. It's a simple rule, but one patients seem to forget. Hope to see you soon!!!! !